The cleaning of the nebulizer is very important. Improper nebulizer cleaning can result in its inefficient performance. First, take the nebulizer into pieces primarily, before disconnecting it from the network. Disconnect the airway tube, take the nebulizer chamber into pieces. Do not put an air compressor (this is the box that makes noise) on a piled or dusty surface. ALWAYS remove ALL remnants of the drug from the drug reservoir. After every inhalation, rinse thoroughly the nebulizer chamber, mask, nosepiece, or mouthpiece (whichever was used). First of all, wash in warm water with a cleaner, then rinse them under a stream of clean, hot water. Disinfect the parts of the nebulizer chamber, and the available inhalation caps are held on the last day of the prescribed course. If you use a nebulizer daily (for example, basic therapy for bronchial asthma), claening should be done every 2-3 weeks. If the compressor becomes dirty, wipe it with a soft cloth dampened in water or a mild cleaner. The compressor is not waterproof – it should not be washed under a stream of water. I usually rub it with a slightly damp cloth made of microfiber. Do not make use of the nebulizer until the washed parts are completely dry. Do not use for drying such devices as hair dryer, microwave oven, etc. If the airway tube is dirty from the outside, wipe it with a soft cloth dampened in water or a mild cleaner. It is not necessary to clean the airway tube every time. Manufacturers advise, after a year of use to replace the nebulizer chamber. For information on correct cleaning of the components, see the special table that is included in each instruction for the nebulizer. If you use a commercial disinfectant, follow the manufacturer’s instructions for diluting the solution. first, the parts are placed in the cleaning solution for the stated period of time. then they are removed and washed under a stream of clean hot water and allowed to be aired. details can be boiled for 15-20 minutes. Lifehack: You cannot boil transparent parts, but transparent is exposed for it. When boiling the parts, look for water to be enough. A lack of water can lead to deformation of parts. The bump (a little blue thing) is an important part of the nebulizer chamber, which is used to spray medicines. Rinse the bump after each use. Pollution of the bump blocker can cause blockages, and lead to loss of effectiveness of drug spraying. Do not use brushes, pins, needles, etc. to clean the bump stopper. This can lead to damage, loss of spray effectiveness, and the therapeutic effect weakening. Do not dry the parts of the nebulizer chamber with a microwave oven, hair dryer or dish dryer. If the air filter has changed color or used on average more than 60 days, replace it with a new one. Usually, a set of filters are included in the package with a nebulizer. Use only air filters from the manufacturer of the nebulizer, developed for this device. Do not use the device without a filter. Filters can be installed by any side. Do not wash or clean the filter. If the air filter is wet, replace it. Wet air filters can lead to blockage. To prevent clogging of the air cleaner cover, clean it regularly. Just wash it, make sure it is dry, then set it back up. Contact the dealer of the company to purchase additional air filters, as well as other parts of the nebulizer (you can google where there is an official representative in your city). 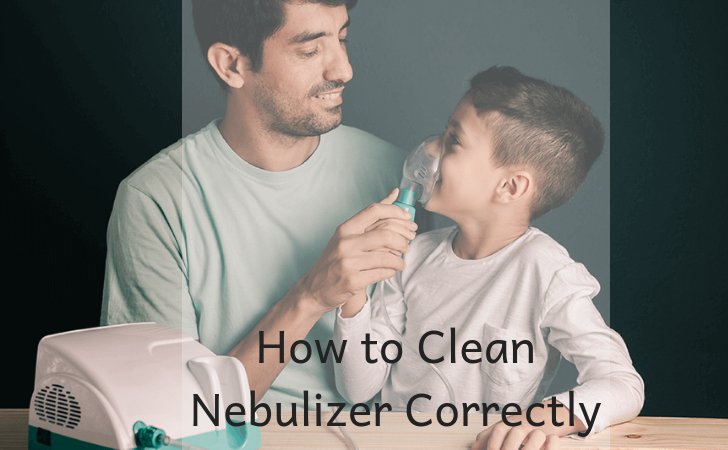 Cleaning and disinfection of the nebulizer are a simple, but very important, issue. Do not forget about it!